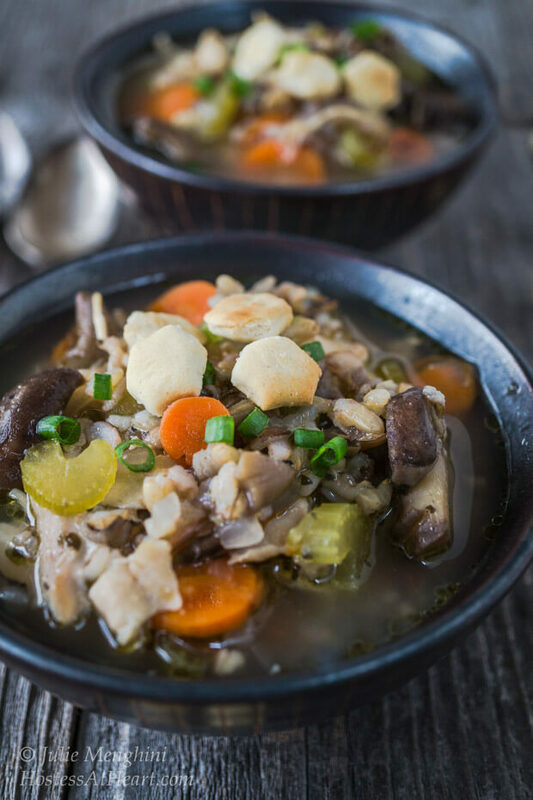 A delicious Easy and Healthy Chicken Wild Rice soup that is low fat and packed with good for you ingredients. 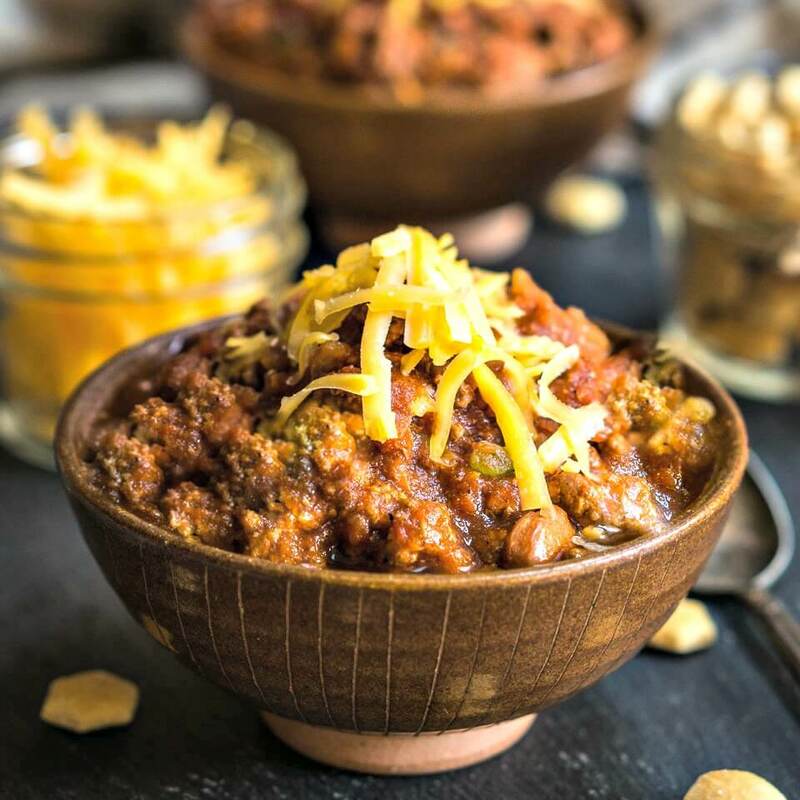 It’s perfect for a chilly day and an easy way to put a healthy meal on the table. Who has a food hangover? I do I do! I think my grandmother was right. If you aren’t feeling the best, chicken soup is the answer. I grew up eating the soup in the little red can and loved it. For the last 30 years, I’ve replaced this little red can with my own version. 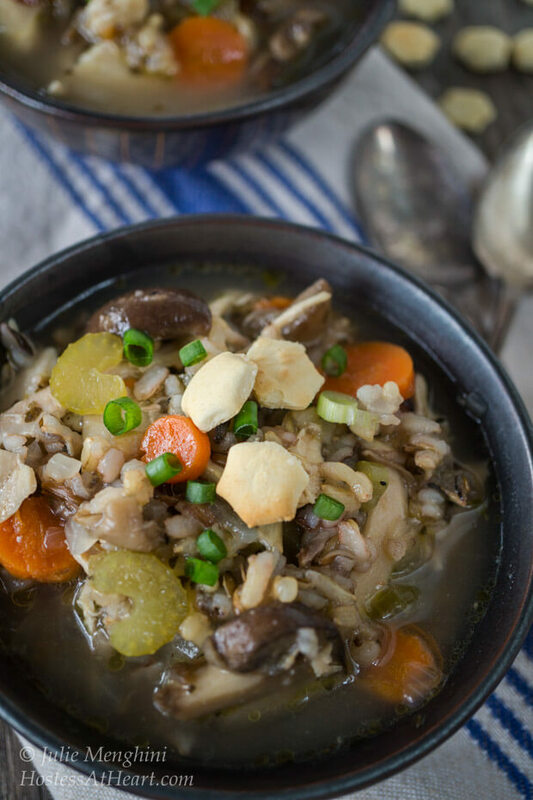 I love chicken soup, but I love Chicken Wild Rice soup. Even my own version has changed over the years. At one time most of my homemade soups were made by combining several ingredients together and letting them slow cook and do it’s thing. Soups, stews or slow cooker recipes are very forgiving. I’ve found a tastier method that doesn’t take much longer. Instead of boiling all of the ingredients together, I roast the chicken in the oven and prepare the other ingredients individually before combining them all together. 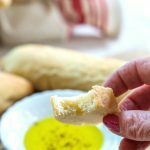 Using a homemade chicken stock is also a great way to get a clean delicious flavor, but you can certainly use commercial stock, which is a time saver and you will still have a yummy dinner. I’ve included how I made mine in the recipe. I just finished this pot of soup, and thought I had better share it because it’s just darned good. We had it for two dinners and one lunch and still had some for the freezer. Every time John sat down and took his first bite he would say, “This is a good soup. Well more like Guuuud soup. Soup is such a great way to reset your body after indulging over the holidays. It is healthy and so good for you. This recipe is the last one that I made. It is very versatile. You can use whichever veggies that you enjoy. I served almond poppyseed muffins on the side….soon to come. 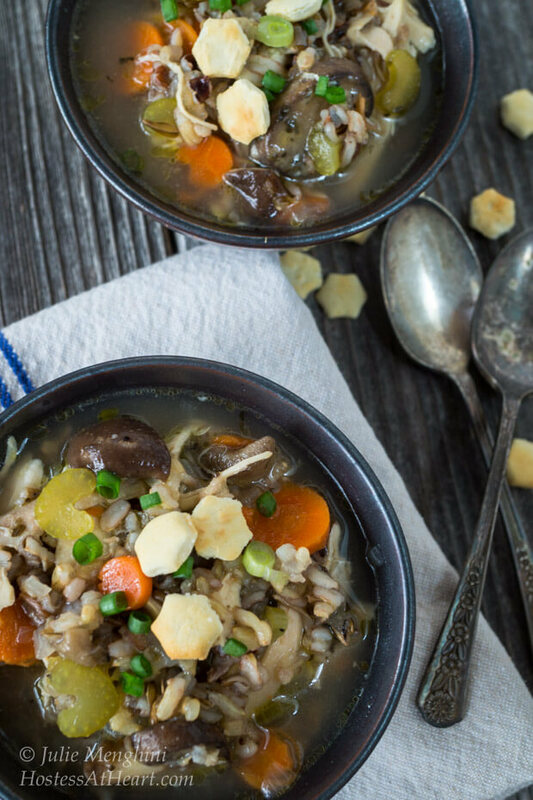 An easy & healthy delicious Chicken Wild Rice soup that is low fat and packed with good for you ingredients. It's perfect for a chilly day and an easy way to put a healthy meal on the table. 6 sprigs of fresh thyme tied together with kitchen twine. Preheat oven to 325 degrees F. Bake chicken on two rimmed baking sheets lined with aluminum foil for 45 minutes or until done. Cover and allow to cool to touch. Remove meat from bones and refrigerate. Place bones in a 7 to 9-quart dutch oven or stock pot with 4 rough chopped carrots, 4 stalks of celery, 3 cloves of garlic, one onion quartered, thyme bundle and bay leaves. Simmer for two hours. Pour stock through a colander into a large bowl. In a 7 to 9-quart dutch oven or stock pot, cover bottom with a thin coating of vegetable oil. Add 4 diced carrots, 4 diced celery stalks and 1 diced onion. Saute with chopped mushrooms until they just begin to soften. Add 3 cloves of minced garlic. Salt and pepper to taste. Add stock, rice and meat. Simmer until hot. Store covered in the refrigerator. Soup also freezes well. If using commercial chicken stock, add fresh thyme and bay leaves to stock and allow to simmer before adding vegetables, rice and meat. Add enough to cover the other ingredients. More will make a thinner soup but flavor will still be wonderful. Less will make a thicker soup. I recommend using at least 3 to 6 quarts. If you like soup like we do, here are a few more of our favorites! All I want to do is make soup lately as it has been so cold (for us) here. This soup looks wonderful! So warm and comforting. Your pictures are beautiful, too. I love new soup recipes so am glad to get this one! LOL…cold for you. It’s cold for me here right now, and like you, all I can think of is soup and comfort food. 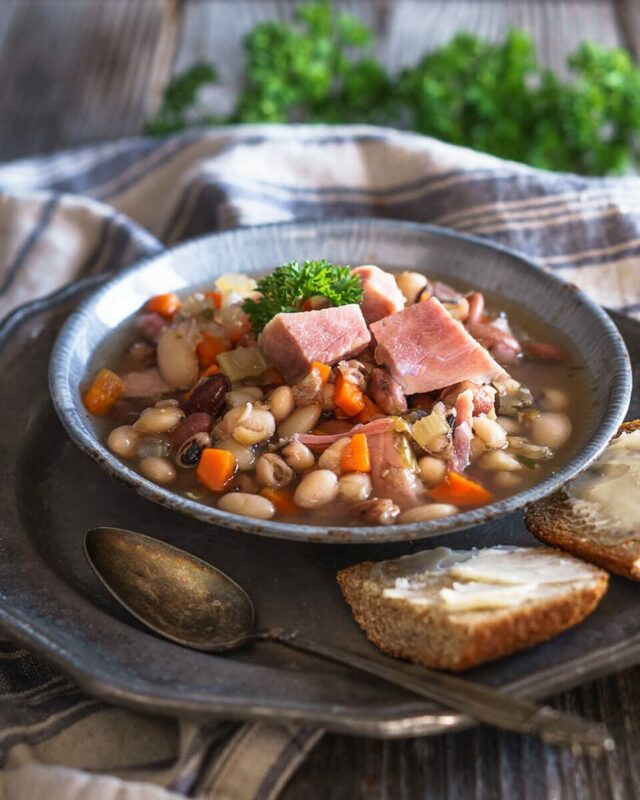 This looks like the perfect soup for these cold nights! 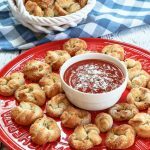 This recipe has been featured and pinned at Tasty Tuesday. Thanks so much for sharing it! I popped in and saw my soup had been featured. Thank you so much! It was such a nice surprise to my day! Thank you so much Petra! I hope you had a wonderful Holiday and I wish you a Happy New Year too! I always love seeing the works of art that you call food too! 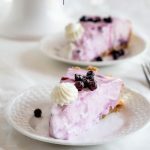 This sounds so refreshing and healthy after indulging (actually over indulging .. :/ ) in a variety of very sweet and rich foods during the last week! Thank you Anna. It is very good and you are right that it leaves you feeling satisfied instead of bogged down. Plus, I love soup this time of year. Hope you Christmas was wonderful! I would very happily down a bowl or two of this soup – it looks just marvelous I think it’s a great idea to coax the flavor out of the chicken by roasting and your soup isn’t murky at all – just gorgeous! THanks for bringing this to Fiesta Friday! 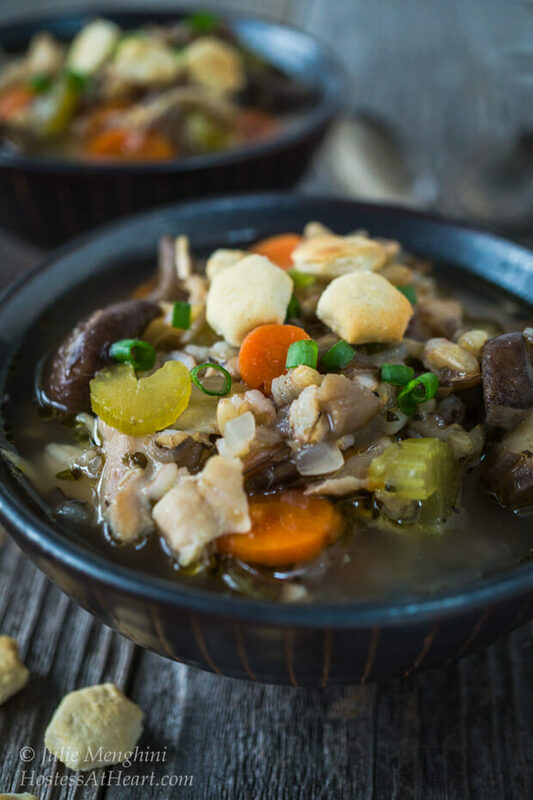 Thanks for sharing this hearty and comforting chicken soup recipe. You’re right, it’s perfect for this time of year. So nice to warm-up to a good bowl of soup – yum! Thank you Lily! Hope you had a wonderful Christmas! 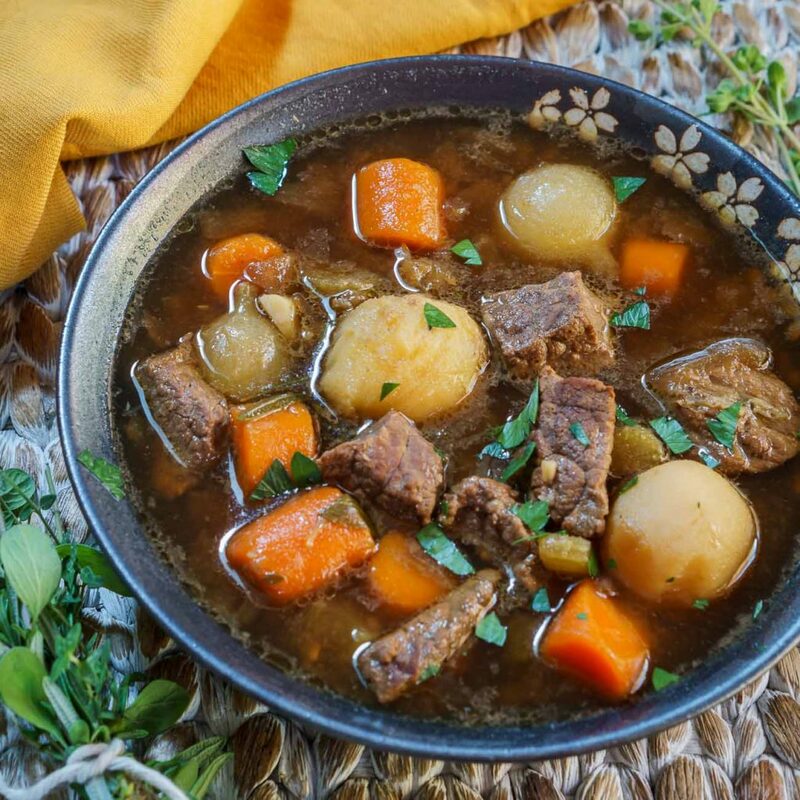 This soup looks just about perfect for the gloomy, rainy weather we are having! 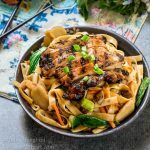 Looks delicious and I love the use of wild rice, I have a pack in my pantry and now I know how I’m gonna use it 🙂 Hope you had a very Merry Christmas & Happy FF #100! Thank you! I agree that this weather just says soup is a must! Christmas was wonderful just as FF is! Never thought to roast my chicken for my chicken noodle soup, but what a great idea! For my gravy I always roast the chicken and it turns out some of the best broth! Thanks for bringing a favorite soup any time of the year to our big 2 week celebration – Fiesta Friday #100. Happy Holidays and Merry Christmas to you Julie. Thanks Judi! I don’t know why this never occurred to me either. Hope you had a wonderful day. I sure did. Both of my kids are home! I absolutely love your twists to that classic, Julie! Haven’t had any wild rice in a while, so I’ll absolutely have to give this a go. Have a wonderful Fiesta Friday 100! Thank you Ginger! Happy FF to you too! Thank you Sarah! Me too, it’s snowing and up to 6 inches in 5 hours. Ready for Santa now. There is nothing more heart warming than a bowl of chicken soup. i like your wild rice version very much. makes a complete delicious meal!! Thank you skd! We just love soup and this one was a keeper! There’s nothing like a good bowl of chicken soup anytime of the year in my opinion. Love the addition of wild rice and mushroom. I too make my own chicken stock from a roasted chicken carcass, it has so much more flavor than the store bought ones. Those almond poppy seed muffins sound real tempting too, looking forward to that recipe Julie. Thank you Loretta! I agree, I can eat soup year around, and homemade is the only way to go. Hope you are enjoying your week. My son got home yesterday and I am just loving having both of my kids together. Cooking up a storm. Have a great Christmas with your family Loretta!